I have a 1930s highboy chest of drawers, made by American Ball Co. and designed by Russell Wright. It is blonde maple wood with rectangular pulls. 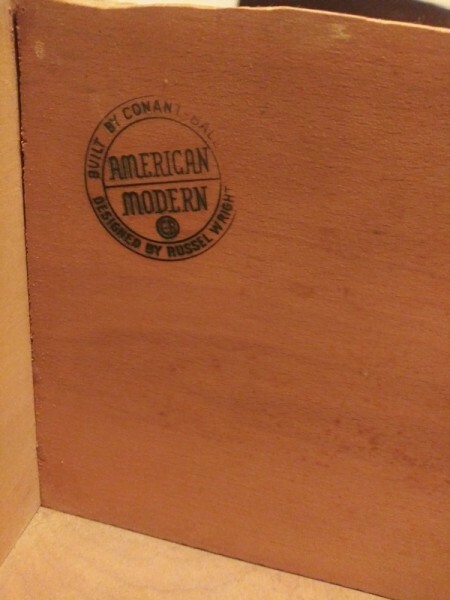 It is stamped on the inside of a drawer. It is 46 in. high, 33 in.wide and 20 in.-deep. The pulls on drawers are 1/4 in.x 10 in.across. It is in excellent condition. Conant Ball closed in 1980. These are neat pieces!! You are lucky to have something that has held its value!! Online I have seen exact pieces like this selling between 100 and 1,200 dollars. Why the huge range? The lower price are where people (individuals) sold it on sites like PicClick or LetGo or Facebook Marketplace. The high prices are SOLD prices from auction houses around the country. You would do best selling this through a vintage store/antique dealer (even though it is not a true antique). You will get more for it that way (at least where I am that is the case). Most people will not pay big bucks for famous designer furniture when Jane Smith sells it, but if Jane Smith Antique Boutique on FUFU street sells it in the city, they pay it! You will get a percentage of the sale, but it will still be more than you would fetch selling it yourself. These are classic pieces that will last a lifetime!! Post back where you are located and how much it fetches for you!! Thanks for sharing this classic!!! I live in Knoxville Tennessee . So if anyone reads this and interested in buying the chester drawers,please. Email me. 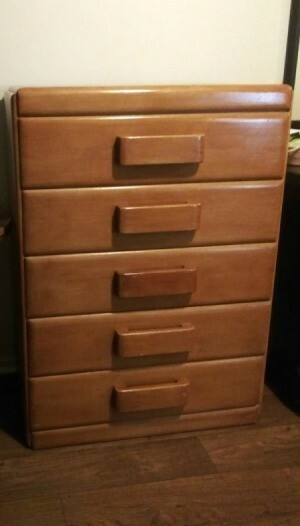 You have a very beautiful chest of drawers. The specific type is a Russel Wright (American Modern) Maple Secretaire - Snyders, made in the 1930 era. I would say you will get a great price on this piece. It has stayed in excellent condition, in my opinion.